Unlike toys made of lightweight plastic, many wooden toys have a bit of weight to them, so when children interact with the toys they are more aware of what they are doing. This weight can be particularly beneficial for children with delays in the development of their fine motor skills or those with sensory disorders because heavier toys will help them feel their movements as they work to develop their skills. The tactile element of wooden toys also mean children have to think more and exert more energy as they play and learn. For example, the wheels on a wooden toy car may not move as smoothly as on a plastic or metal car, requiring children to apply more force to make it move. As children manipulate the wooden toys, you don’t have to worry much about their safety because wooden toys are designed to be safe. Most wooden toys and playroom furniture won’t break easily, which means children won’t be exposed to sharp edges or small pieces that have broken off of the toy. They’re also generally non-toxic and made from natural materials, which means children can manipulate them by chewing on them or sucking on them. You don’t have to worry about polluting your home with unknown chemicals or worry about what your child could possibly be eating. Not only will wooden toys not pollute your home or the environment with chemicals, they won’t pollute your home with a lot of noise. While this lack of noise keeps kids from being distracted, it also provides parents with the quiet they so often need during the day. 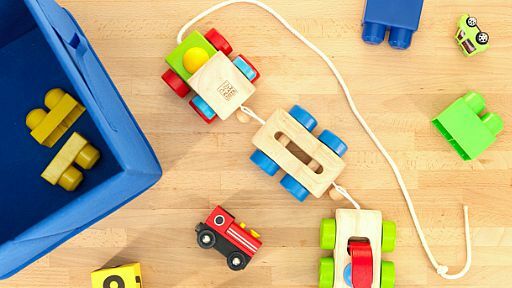 Children cannot accidentally leave a wooden toy running or have to listen to incessant beeps and boops as they play. Instead, you can focus on the sound of your children’s voices and laughter as they learn and interact with their wooden toys. When your children go to sleep, the toys are asleep and quiet too.